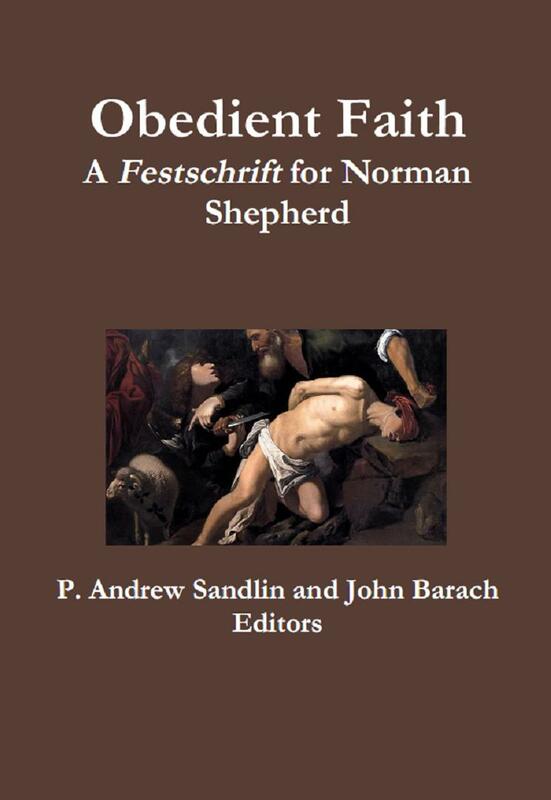 At long last, it’s finally here: P. Andrew Sandlin & John Barach, eds., Obedient Faith: A Festschrift for Norman Shepherd (Mount Hermon, California: Kerygma Press, 2012). In our I hope brief blog-versation, Doug Wilson has posted a couple more things to think about. In one he asks who our father/Father is. We either have God or the devil as our father. Well, yes and no. I’m with Doug in what he’s getting at, I think, but here again I’m not so sure about terminology. The devil as father was a liar from the beginning. Well, every child lies instinctively. You don’t have to teach kids to lie. Those little children that Jesus wanted to come to him were “of their father the devil” in some sense. So am I, since I still have an Adamic death-nature that messes with me — and as far as I’m concerned Romans 7 STILL is talking about that, even if I’m increasingly lonely in thinking so. When Peter confessed Jesus as the son of the Living God, Jesus blessed him for listening to the Father. Five minutes later Jesus condemned him as a mouthpiece of Satan. Also, of course, I had a physical father; and if I were a Presbyterian clergyman I would address Presbytery as “Fathers and Brethren,” acknowledging that older minister are fathers to younger ones. Every human being has God the Father as his father by creation; Adam as his father by generation; and the devil as his father by Adam’s decision to give the world to him. Christians have God the Father as father because they are in Christ, the Son. My pal Doug Wilson has been writing a series of essays on “Life in the Regeneration” (I like the title!) and I’m being constrained to say something. So let me do this as a series of points. 1. I’m a postmillennialist, because I actually believe (gasp!) that Jesus was serious when He said He intended to disciple all nations. So, I don’t think I have to get everything right today. In fact, I know I won’t. In the year AD 35,678, some theologian in what is now Sri Lanka will come up with the very best explanation of the things under discussion, and I’m willing to wait. Well, uh, duh, no, that’s not what is going on. First of all, the Holy Spirit is not wasting His breath showing us Jesus putting down various morons. This conversation is included because it is profound. Second, John’s gospel deals with profound depths, as all expositors agree, and so again this is not some stupid conversation. Third, Nicodemus was a member of the great Sanhedrin (John 7:50), which means he had served in a local sanhedrin as a judge for a number of years before being selected to the first small sanhedrin, then after more years advancing to the second small sanhedrin, and finally being approved to be one of the 70 members of the Great Sanhedrin (Article, “Sanhedrim,” in McClintock and Strong, Cyclopedia of Biblical, Theological, and Ecclesiastical Literature ). He was therefore an older man, probably twice Jesus’ age and worthy of respect. Fourth, Jesus tells us that Nicodemus was “the teacher of Israel” (John 3:10). Are we to take this as sarcasm, unworthy of the spotless son of man who knew to respect the aged? No, Jesus means what he says: Nicodemus was the preeminent theologian and teacher in Israel, and therefore on the surface of the earth, and not a fool. Finally, Nicodemus was not at all reluctant to defend Jesus in public (John 7:50) and to be seen helping to bury him (19:39). (I’ll bet Caiaphas was pretty angry about that.) He came to Jesus at night in order to have a long conversation with Him uninterrupted. The notion that Nicodemus was not a believer does not stand up. He certainly was a faithful old covenant believer who was headed for paradise. If by “regeneration” we mean someone who has a life with God and is destined for heaven, Nicodemus was regenerated every bit as much as Abraham, Moses, David, and Elijah. Is James B. Jordan an “Evangelical”? During the last couple of weeks, Douglas Wilson has issued several posts over on his Blog and Mablog blog that deal with “evangelicalism” and who is and who is not an “evangelical.” In the course of these postings, Doug has written that while I am a fine Christian who has much to offer everyone, I’m not what he means by “an evangelical.” I’m a conservative Biblicistic protestant (my phrase), but not an “evangelical.” See here and here. None of this really bothers me, but I have received more than one request that I comment on the issue involved, including from Doug himself. Hence this first of a series of essays. First of all, then, what is “an evangelical”? That will be our topic in this posting. The use of the adjective “evangelical” as a noun is, to start with, a bit strange, but “Evangelical Christian” is the actual term, with “evangelical” being shorthand. The usual and broad meaning of “an evangelical” in the United States (where it matters most) is this: someone who accepts that the truth claims of the Bible are without error not only doctrinally but also with respect to historical and spatial matters, who accepts the teaching that God is three equal persons in one Godhead, and who trusts in the work of Jesus Christ alone for his justification and salvation. This is the definition that will get you into the Evangelical Theological Society, of which I have been a card-carrying member since 1976. And in this sense, James B. Jordan is most definitely “an evangelical.” And I know that Douglas Wilson fully accepts that this is so. 2012 Annual Biblical Horizons Conference. Dates: 16-20 July, Monday evening to Friday noon. Peter Leithart: Gratitude and Thanksgiving. Jeff Meyers: The Ministry of the Church as Priest, King, and Prophet. James Jordan: Basics of Biblical Worldview. Worship: Sung Vespers each evening; Psalm Roar in the mornings. Film: The Complete Metropolis. With the discovery of the missing 25 minutes in Argentina two years ago, it is now possible to view the entire 2 and 1/2 hour film for the first time since 1927. James Jordan will lead discussions of the remarkable use of Biblical and Christian imagery and symbolism. Metropolis argued that it is the church and acts of Christian sacrifice that alone can reconcile workers and capitalists, and prevent communist revolution. Price: $100 per adult. $75 per high school or college student. $125 for families. Youth Conference? : Friday night and Saturday morning. Since many young people stay over from BH with the intention of going to the CREC Youth Conference in Texas, we may have a meeting of the RPZTL* this year and present material on how to think Christianly about the present world. *RPZTL: The BH youth arm: the Righteous Power Zombie Terror League (Righteous in Christ; Powerful in the Spirit; Dead, yet Alive; Wise in the Fear of the Lord; Leagued in the covenant).